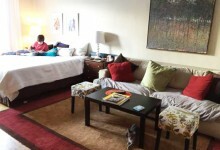 Negotiating the space constraints inherent in sharing an apartment with a significant other or spouse can be tough enough, but, once you throw kids into the mix a whole new set of challenges tend to crop up. 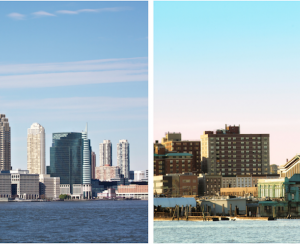 However, New Yorkers are nothing if not creative and resilient, so, below we present five common apartment challenges that are "born" with the baby—along with solutions. Hello, growing pains! 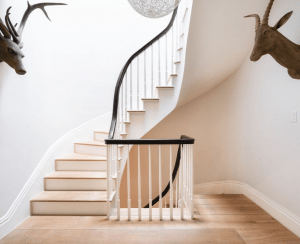 Just because you’ve decided to go from zero to one, or one to two children does not mean that you suddenly have enough money for a full-scale gut renovation—if your building would even approve it. Solution #1: A simple room divider bookcase can be a godsend with very little work involved at all. 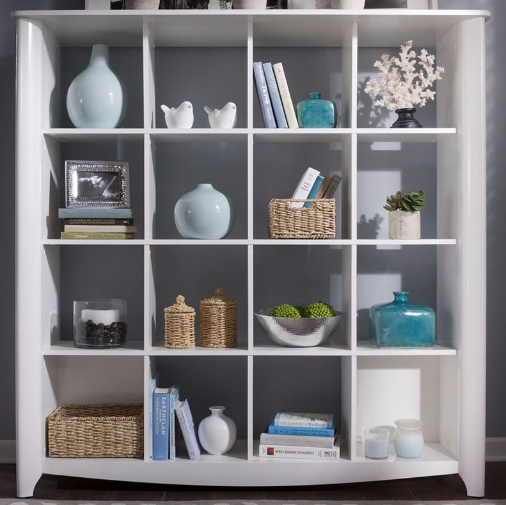 This Bush Aero collection 16 Cube bookcase (shown above) has 16 equal compartments and will not only create a makeshift wall to divide two parts of a room, but will also give offer you some additional storage (sale price: $269.88). Solution #2: For a little more permanence and much more privacy, you could go the pressurized wall route. Few New Yorkers haven’t had a pressurized wall at some point in their rental life, which makes one of these almost a city rite of passage. Just remember that you have to have a window in every room to make this legal, and building management companies are cracking down on these more than ever. Make sure it's okay before you go ahead. Apartment living can be super noisy. Thin plaster walls and residents with varying schedules can make getting your baby or child to sleep pretty difficult when the neighbors next door are just getting ready to host a dinner party. Instead of constantly complaining to the super, your best bet is to try to muffle the sound coming into your apartment. Solution #1: Large, ceiling-height furniture or wall hangings can go a long way in lowering the decibel level of the sound that you hear through the walls. While it won’t be 100 percent, at the very least you can make your apartment feel a little bit less like your walls are made out of paper. Solution #2: A white noise machine. 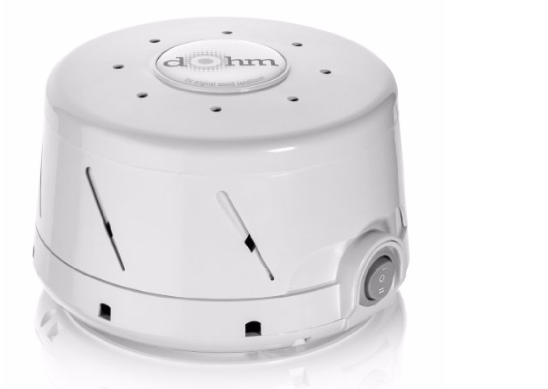 While there are numerous tablet and smartphone apps that supply white noise, one of this writer's personal favorite gadgets is the Marpac Dohm-DS All-Natural White Noise Sound Machine (shown above). The same white noise machine used by many doctor’s offices, this is a simple two-speed motor with an fan that provides the sound of rushing air (and it's usually available for under $50). It’s also the "official sound conditioner" of the National Sleep Foundation—not a bad endorsement. Children often wake up earlier than the rest of the world and want to play. Even during normal hours, toppling block towers, bouncing balls, jumping feet and zooming toy cars can create less-than-dulcet tones which may not endear your family to your downstairs neighbors. Solution #1: Wall-to-wall carpeting or large area rugs. 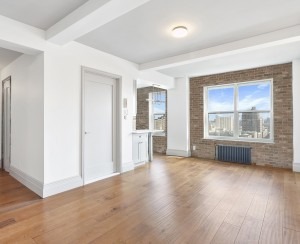 Most buildings actually require that up to 80 percent of an apartment’s floor area be covered with carpeting, so you could just jump the gun and have your apartment carpeted before noise complaints become an issue. Solution #2: Foam floor tiles are pretty well known to most parents as an easy solution to cushion the floor for babies just learning to crawl and for young children who play a lot on the floor. These tiles have the added bonus of being easily scrubbed and impermanent enough that they are easy to pull up and replace when it’s time to move or to redecorate, something which makes them much simpler than carpeting. 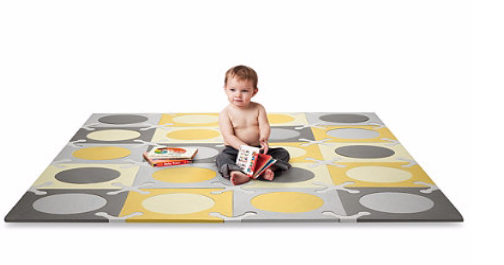 The $79 Skip Hop Playspot Interlocking Foam Tiles (below) is a great alternative for those immune to the charms of the technicolor alphabet adorned tiles ubiquitous in NYC apartments that would be a better fit for a nursery school. Honestly, double-duty furniture is your best bet. High chairs are an especially tricky purchase for an apartment-dwelling parent. Those big plastic high chairs with their huge footprint only work in the suburbs and in the largest of apartments. Solution #1: A bouncy seat that doubles as a first feeding chair. 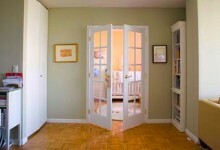 A baby bouncer with a machine-washable cover can double as a place to feed baby his or her first few months of meals. Our absolute favorite bouncy seat is the Baby Bjorn Balance Soft, which is 100 percent kid-powered and folds completely flat for travel or when not in use. It retails from $113-$220, depending on the model. Solution #2: A simple wooden high chair which can turn into a child’s chair, adult chair and step stool. The Stokke Tripp Trapp (see photo below) is truly the chair that keeps on giving—you can use the attachable baby piece for the first two to three years of your child’s life and then reconfigure the chair into a chair that can even support a large adult. This chair is also great because, even when set up as a high chair, it can be pushed into the regular family table instead of sticking out into the middle of your room. It retails for $249. 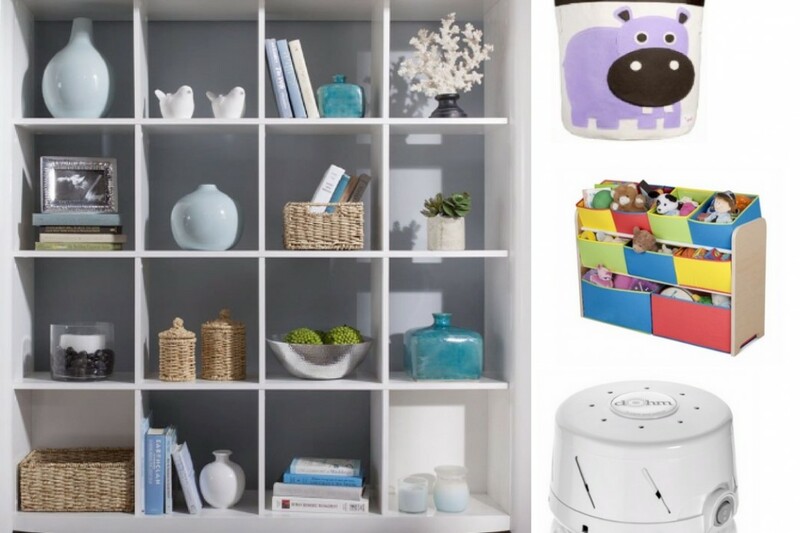 While it would be wonderful if everybody had enough closet space in which to tuck away all of the seemingly millions of toys and accessories that seem to come along with children, most people, except for the most accomplished minimalists, do not. 1. 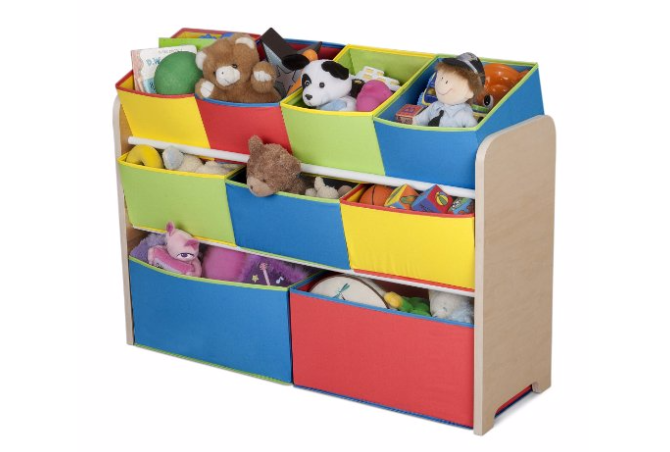 The Delta Children Deluxe Toy Organizer (a steal for about $35) has four regularly sized bins, three double sized and two extra-large bins which fit into a wooden shelving unit. Even young toddlers are able to pull out just the bin that they want instead of dumping everything out onto the floor. 2. 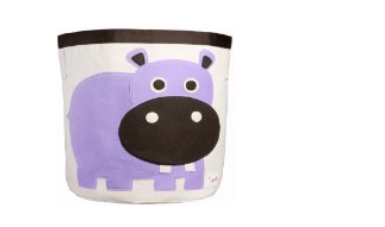 The 3 Sprouts Storage Bin ($20) is collapsible when not in use, but is large enough at 17 x 17 to hold a ton of stuffed animals, toys or even laundry. Plus, you can choose between many cute animals on the front. 3. There are a lot of storage benches and ottomans, made out of a host of different materials, but the $245 Skyline Furniture Skirted Storage Bench is one of the most "furniture-like" of any of the ones that we've found. What better use of space than to sit on top of your storage?